(CNS): There are only three days to go before the Grand Prize Draw for the 2009 LIME Christmas Goodie Bag Promotion when a lucky LIME customer will win $10,000 cash do with as theydesire. The draw, which is scheduled for January 6, 2010 will bring the curtain down on LIME’s massive Christmas Goodie Bag promotion which saw hundreds of customers winning exciting prizes such as, instant mobile credit with top up, and instant text to win prizes of CDs, DVD players, jump drives and cash, mobile phones and vouchers for groceries, petrol and home goods in the twice weekly draws. 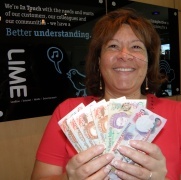 One such winner, Susan Dixon (above) was so excited to receive her cash prize last week. “This is such a great surprise for me and very welcomed at Christmas time,” she said. Throughout the promotion, which began in November, customers have been able to qualify for the grand prize by topping up their prepaid phones; paying any LIME bill in full and on time; talking for a total of five minutes in one day; signing up for any new Internet, mobile, NetSpeak or HomePlan service, upgrading an existing service or if they registered for an E account or to pay LIME bills by direct debit.